Show your love in cute and personal ways! The sticks found in frozen lollipops (or Popsicle sticks) can be used in so many different ways. You can buy boxes of them for very little and use them to make so many different arts and crafts. Remember the birdhouses we made when we were kids? Some stores even carry colored ones. In preparation for Valentine's Day, it's time to bring out the wooden sticks to make pretty arts and crafts, on your own or with the kids! A great way to remind your loved ones how much you love them! The possibilities are endless, or almost! A bit of glue, gouache (poster paint), scraps of paper, pipe cleaners and any other materials that inspire you can be used for this. To inspire you, we've put together some easy-to-make and really cute designs! Warm and cozy up in February with irresistible animals, red and pink hearts, and so on! Watch the video at the bottom of this page to guide you in your creative and loving projects! Red is the color of love so the ladybug is always a good choice. In addition, it is said that ladybugs bring happiness! 1. Glue the wooden sticks together to form the shape of a rectangle. 3. Paint the center stick as well as two sticks at the top of the wooden rectangle. 4. In the center of the black part, glue two already twisted pipe cleaner tips and then two eyes, one on each side. 5. Dip a finger in the black paint and print dots on the ladybug. In the same fashion, you could create a cute bumble bee with pretty heart-shaped wings. 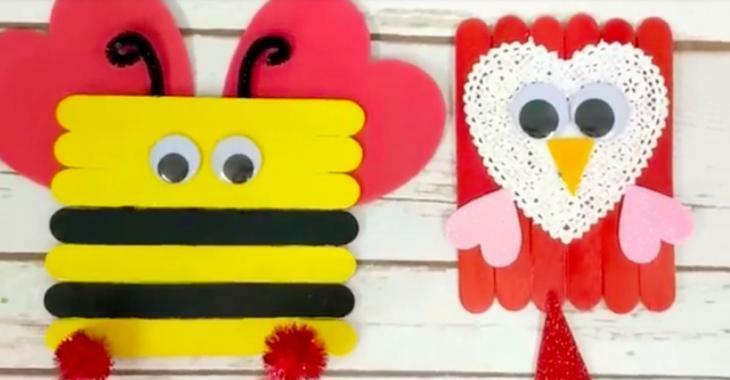 By gluing 6 red-painted sticks in the form of a rectangle and adding a heart-shaped paper doily or any other type of heart, some eyes, a beak and heart-shaped wings, you will have created a beautiful love-hooting owl! White painted sticks, big arts and crafts eyes, pieces of wool, a few pencil strokes, hearts and a cardboard horn: this one is just too cute! 2. Glue the triangle onto a piece of pretty paper and trim away what sticks out. 4. Glue a fuzzy pompom nose, cardboard circles or buttons for eyes, two triangular ears and decorations of your choosing, and, there you have it! Obviously it will now be easy for you to use your imagination to create all sorts of different designs! The most important thing is to do it all with love!